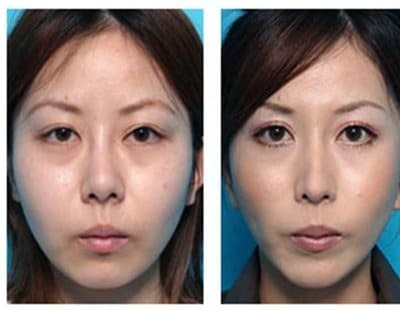 The new fashion among Asian women is facial remodelling in order to have a more ‘Western’ face. In recent years, the ideal of beauty in the West for Asian women has been less of the ‘standard’ Asian face, but one which more resembles the ideals of Caucasian, western beauty. Several pieces of research have shown that one out of every five oriental women have undergone ‘aesthetic’ intervention to westernise their face. Most changes take place to the nose and eyelids. Another preoccupation of many Asian women is skin lightening, in order to tackle pigment disorders. The ageing process amongst Asians starts to show with the appearance of pigmentary marks. The first irregularities appear around the age of 30 on areas which are most exposed to light such as the cheeks and forehead, and where there are melanin deposits. This hyperpigmentation becomes more obvious after 50. The skin also yellows with age. Among Asians, as among Caucasians, the upper third of the face is bigger than the lower third. Among Asians, the middle third of the face is bigger than the upper third. It is the inverse for Caucasians. Among Caucasians, the lower third is bigger than the middle third, while among Asians the two lower thirds are the same. The neo-classical canons of the face divide it into five equal parts. 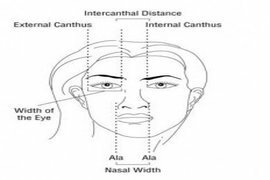 These canons predict the intercanthal distance, and the width of the eyes and the width of the nose are equal. Among Asian women the average intercanthal distance is 1.24 times greater than the width of the eye. 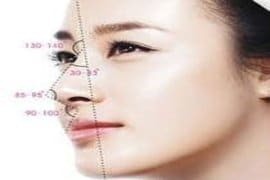 Among Asians, the base of the nose is wider than among Europeans, the width of the base of the nose is 1.11 times greater than the intercanthal distance. 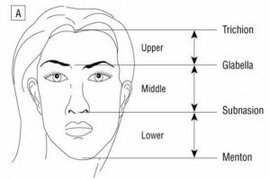 There is mainly no difference between the angles of the face of Caucasians and Asians: this holds for the naso-mental (chin) angle, mento-cervical (chin-neck) angle or the naso-facial angle. The naso-frontal (forehead) angle is more open among Asians. Among Asians, the labial commissures (corners of the mouth) pass through the centre of the iris. The majority of Asian women have a large mouth like Caucasian women, and a third have a narrower mouth. 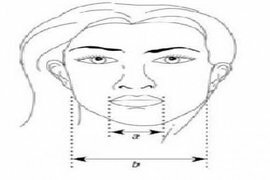 The relationship between the upper lip-lower third of the face is calculated by dividing the length of the upper lip ( calculated from the sub-nasal point to the edge of the upper lip-lower-lip ) by the subnasal point-chin distance. Among Asians this distance is 0.2-0.6 as among Caucasians. 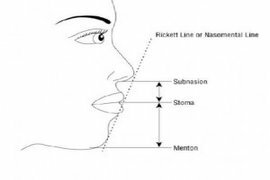 Among a third of Asians, the upper lip is recessed from the Ricketts line ( a line from the nasal tip to the pogonion, the foremost tip of skin of the chin symphysis ) which is the ideal among Caucasians. Among 20% of Asians the lower lip is recessive of the Ricketts line, which is the ideal among Caucasians. 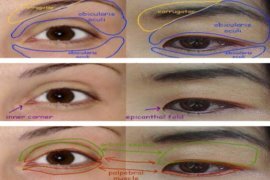 Among Caucasians, the eyebrow arch ( the highest point of the eyebrow ) is found on an imaginary line which starts at the alar sidewall ( edge of the nose ), passing through the centre of the upper eyelid, whereas among Asians the point is level with the outer edge of the iris. 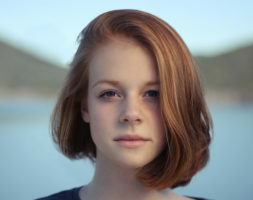 For both groups, the tail of the eyebrow is on an imaginary line from the ala ( edge of the nose ) through the outer canthus of the eye ( outer corner of the eye ). 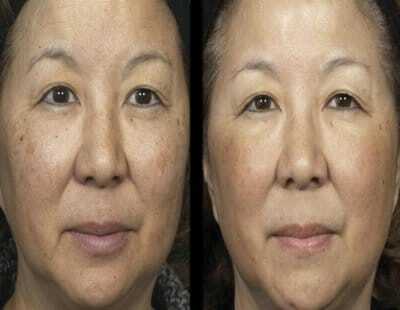 About a third of Asians do not have the supratarsal eyelid fold or crease. When it is present, this fold is either parallel to the eyelid margin, or convergent on the middle part. Among Asians, the supratarsal fold is about 6mm from the lash edge, but the distance is greater among Caucasians. Hyaluronic acid is a versatile product used to create projections and increase volumes. His indications are the treatment of lips, chin, cheekbones, eyebrows, medical rhinoplasty. 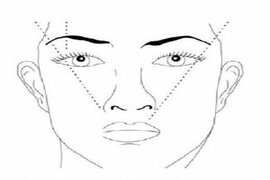 It is difficult to treat medically the proportions of the fifth vertices and the horizontal thirds of the face. The laser can treat all skin imperfections, scars, dull complexion, spots. We use a laser specific to each unsightly. Threads find their indication in the opening of the look, the westernization of the nose, the lift of the eyebrows. Depending on the type of act, mesofils or threads are used. 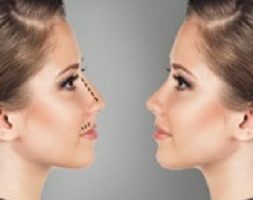 Threds are used to lift the tip of the nose or correct abnormalities of the dorsum. Often they are associated with injections of hyaluronic acid. My nose is more present thanks to hyaluronic acid injections. My gaze is open following the lying of mesofils. Truly pleased with the result, occidentalisation of my asian face by hyaluronic acid injections. Thank you Doctor Romano. I am a woman of asian descent, my face was very round. Doctor Romano refined it with injections, really beautiful result.